The first choice any customer makes when purchasing custom enamel pins is to decide on the manufacturing process and pin style. There is a lot of jargon thrown around in our industry which makes it extra confusing. Check out this Lapel Pin Buyers Guide. FIRST DECISION: Die Struck, Cast or Hybrid? 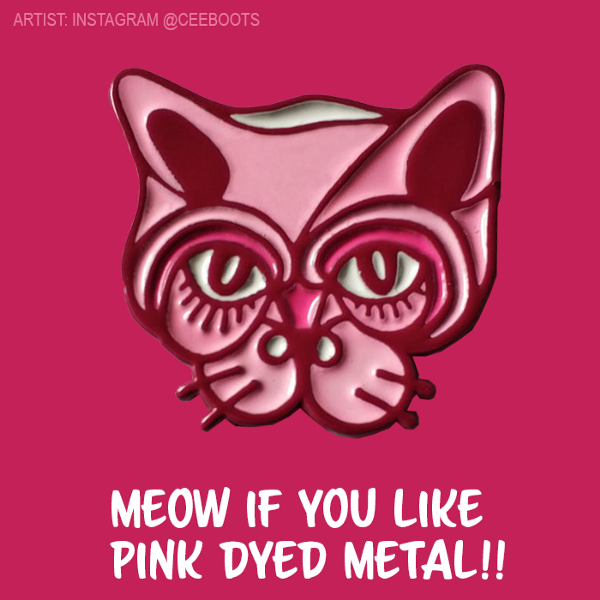 There are three ways most manufacturers create custom enamel pins. You can stamp them or cast them. For more complex designs we offer a blended solution. With this pin type, we start with a stamping mold and trim die. 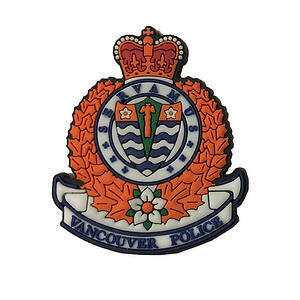 The design is engraved with CNC machines into steel, in reverse. This process is the most common among suppliers and manufacturers. The mold is placed under a hyrdaulic press and a metal strip is placed over the design. Each design is stamped one at a time on a long strip of zinc. In the past factories would use copper and brass but due to price increases, most supplies use zinc these days. It's cheaper and easier to work with. The main advantage this process offers is crisp details. The mold is steel and stands up to repeated impacts. This is the process we use for all of our custom enamel pin orders. With this product, manufacturers create molds with multiple copies of the same design. Molten zinc is then poured into the molds and the finished product dries hard. This process allows manufacturers to make smaller orders more cost effective. The process is not as common as it used to be. The clarity of legibility of the pin suffers a bit with this process. We do not offer this product for lapel pins. 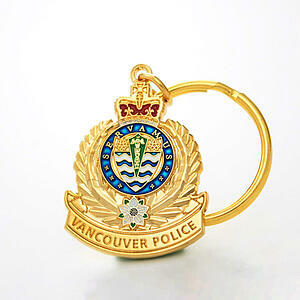 We do use it on larger and thicker medals that are too big to be stamped. you personally prefer this type of pin. OFFSET PRINTED PIN EXAMPLE This pin design has several areas that can't be enamel filled due to size of the areas. (ie the flower petals) We require 2mm area to inject colour. 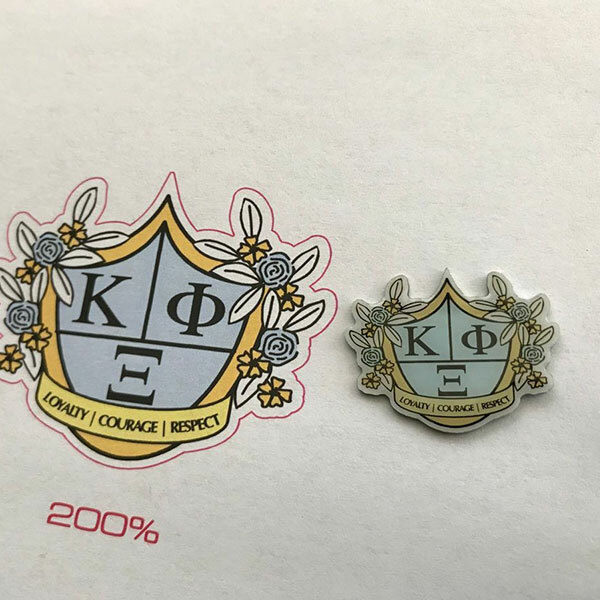 It make sense to use the printed process for this custom fraternity pin. This client has ordered several die struck pins and keychains and money clips. They wanted a new look for the product. PVC rubber was the perfect choice. 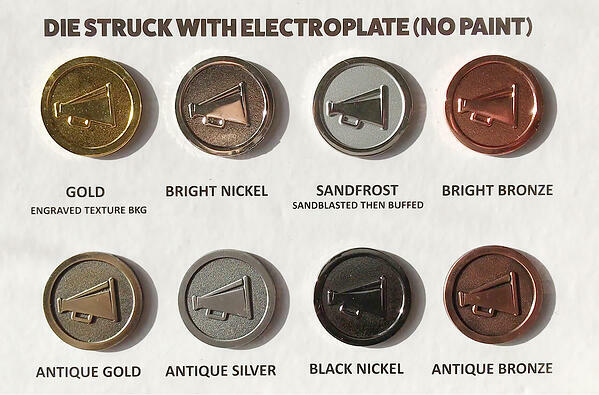 In our experience, 99% of the custom lapel pins we sell are suitable for die struck. In the event it's not suitable we can usually edit your design so that it works. People have a pre-defined idea of what a pin is supposed to look and feel like. Let's not complicate things shall we? There are reasons to use the other processes but those decisions are usually dictated by complex art. Pin manufacturers always have in-house art departments. At our company, art services are free of charge. 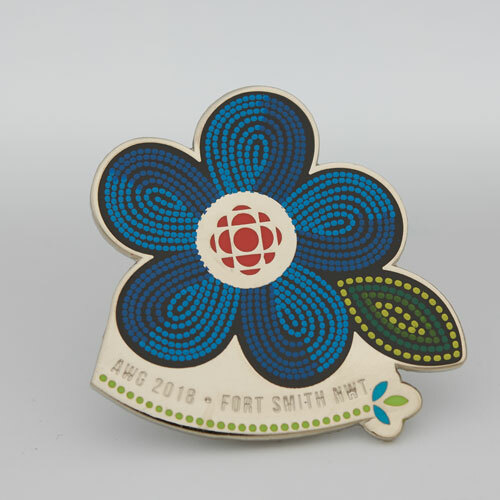 If you get us to do your art, it ensures that best practices for pin design are being followed and your art won't create issues for manufacturing. Creating pins is a multi-step and complicated process. You can attempt to draw your design idea prior to contacting us, but there's a significant change we'll have to edit it. This blog contains dozens of articles to help graphic designers through the process. But in all honesty, it takes our staff at least 2 years to become proficient pin designers. Designing for pins is completely different that print or web. So it depends on your commitment to learning design. It's also common for us to take your idea and edit it so that it means our requirements. SECOND DECISION: Hard Enamel, Soft Enamel or Plain Metal? Here we encounter another strange industry name that doesn't make a whole lot of sense. Enamel is enamel. There is nothing "soft" about soft enamel and the same paint is used on both processes. The difference is HOW MUCH is used. With this enamel process, the paint is level with the surface. This process took hold in the 70's and was invented to replace Cloisonne enamel. (BTW- most people that sell cloisonne are actually selling hard enamel epoxy) Using the hard enamel process also allows for enhancements like silk screening. The design below features blue dots silk screened over black enamel and the effect is quite stunning! When Perceived Value Is Important. Hard Enamel is ideal for things like necklace charms and jewelry. The paint is level with the surface giving it the look and feel of quality. You’ll need to charge more if you are re-selling. Personal Preference. You prefer the way it looks. As an old school dude in pinland, I prefer this process. The pin feels “high-end”. When Special Effects Are Needed. If you require transparent enamels.You can use this enamel type on both processes but it really works well with hard enamel. Especially when you combine engraved background textures. This process offers two advantages. Price and appearance. There is a massive uptick in pin sales to artists and creatives and this market just loves soft enamel! Old school pin buyers thought this process looked "cheap". These days we hear that many people actually prefer the more textured and curved look of the painted surfaces. If you google "enamel pin trend" you'll see what we mean. The other thing that has gone along with this trend is innovation. Pin manufacturers figured out how to dye the base metal for the soft enamel process and this has been a total game changer! The single most compelling reason to select soft enamel is if you want to change the base metal colour to something other than bronze, nickel or gold. The coolest thing that has happened to the industry in the past 5 years is the arrival of dyed metal. This has nothing to do with the enamel. But as an artist you can definitely relate to positive and negative space. Using a black or white dyed metal base opens up a lot of creative possibilities. With traditional base metal (ie- bronze, nickel, gold) you are always compromising your art colour selection to work with the raised metal details in your art. With dyed metal it’s way easier to keep your art the same way you designed it. Otherwise you are always changing details like eyes, action lines and borders to gold or silver. Here is the catch: dyed metal is available only in SOFT enamel process. The primary difference between soft and hard enamel is that the paint is thinner in soft enamel. This gives the enamel a bit of differentiation from the base metal. It catches the light a bit more. Hard enamel doesn’t have that quality. On average, the price of soft enamel is around 40% cheaper depending on your quantity. 4. 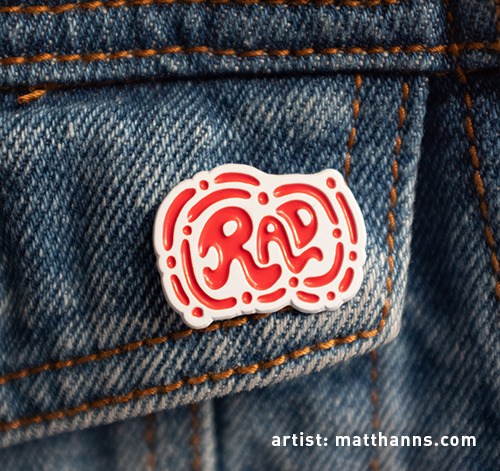 Your Design Is Larger than 1.5"
There is another trend in enamel pin land. BIG pins. Especially on the fandom and collector side of things where artists can get away charging a lot more for a pin. The sizes are creeping up into three and even four inches now! Each process experiences a hefty price jump above 1.25" due to the base metal coil size. 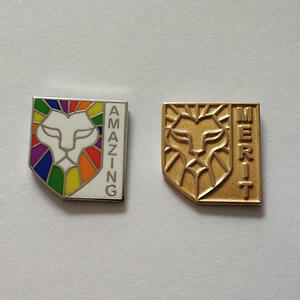 So for larger pins, you’ll probably price yourself out of the ballpark for large pins unless you use soft enamel. We've been a huge fan of transparent enamels for decades. You can combine clear enamels with engraving textures or regular enamel for some stunning effects. In the example below, the blue really "popped" a lot better as a transparent enamel. With glitter enamel, its wise to have a large enough area for the effect to be noticeable. You can read detailed articles about glitter and trans enamels. The last category of pins in this buyers guide is also our favorite! Once you understand metal finishing and textures, you can really come up with some stunning designs! Metal finish pins resemble jewelry and have a simple, understated and classic feel to them. 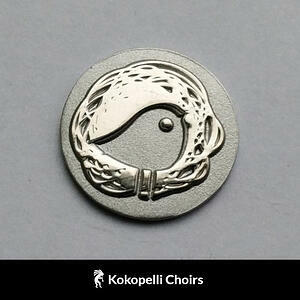 In addition to regular bronze, nickel or gold, we can antique or sandblast the pins for you. You can purchase this sample card here. Corporate Logo Pins. If you want your employees to wear a logo pin, its often preferable for the recipient to wear a simple, understated pin instead of a multi coloured design on their jacket. Historical Pins. We've done a number of pin designs that feature an old building or the face of person. We can use 3d engraving techniques or antique electroplate to give it the right "feel"
Jewelry. Artists and creatives are finding out that there is money to be made in jewelry design. We can craft custom necklace pendants, scarf pins and earrings. We hope you found our lapel pin buyers guide helpful! If you have any questions, be sure to contact us and attach your design so we can help!